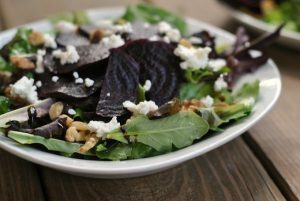 Now, I look at green tomatoes and think, “How can I fry that baby without the guilt?” So, here we are with this recipe. 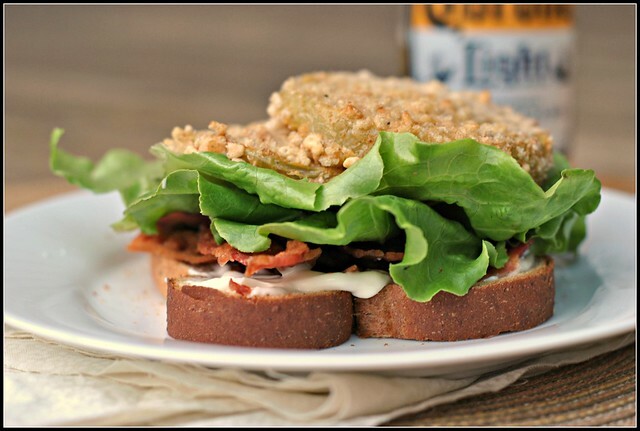 Guilt-free “fried” green tomatoes…in BLT form. There’s just something about them, though. Swoon. Perhaps it’s because they’re fried. Or in this case, faux fried…my favorite kind of “frying”. Leaving the oil out of the equation, I used a seasoned egg dredge and my new favorite not-so-secret ingredient of Rice Krispies. 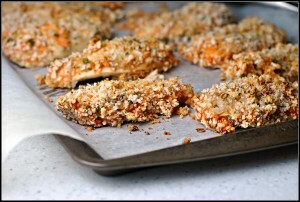 Personally, I love that they’re gluten-free and I do believe they stay just as crispy as Panko breadcrumbs (an important point for those of you who may not regularly stock Panko or who may be unable to find it in their local grocers). The Cajun seasoning adds the perfect touch of southern spice to the unique flavor of the green tomatoes. Your BLT deserves a face-lift, mmmkay? 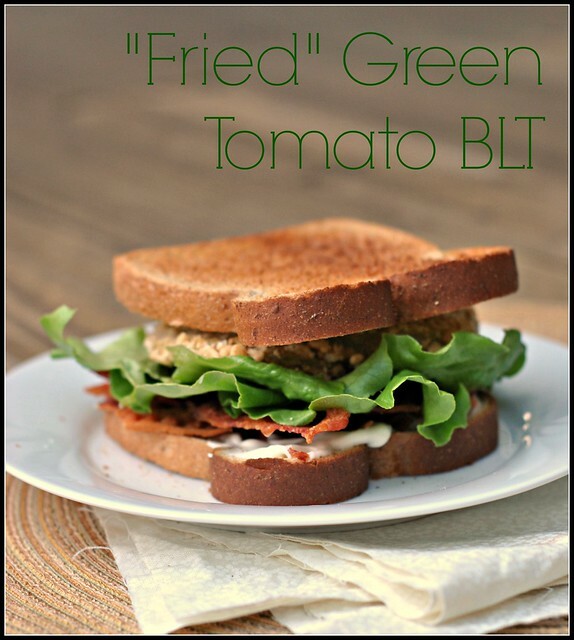 This is not your ordinary BLT...it's better! Preheat oven to 400 F. Place a wire cooling rack over a baking sheet and mist with cooking spray; set aside. In a medium bowl, whisk together the eggs, flour, and Cajun seasoning. In a shallow bowl, combine the Rice Krispies, pepper, and ¼ teaspoon salt. Season tomato slices with remaining ¼ teaspoon salt. One at a time, dredge the tomato slices into the egg mixture, allowing excess to drip off. Transfer the tomato slice to the Rice Krispies and flip to coat; transfer to the wire rack and repeat with remaining tomato slices. Mist tomato slices with olive oil to assist in browning. Bake tomatoes 15 minutes or until slightly golden. Serve 2 slices of "fried" green tomatoes on each of 6 sandwiches, along with 4 slices of bacon, 2 pieces of lettuce, and 1 tablespoon of mayonnaise. Ha, we just made fried green tomato BLTs last night. Flippin’ delicious. Love the use of Rice Krispies! Good tip on using them in place of panko, we have a box sitting around since the kids are just not fans. I just tried fried green tomatoes when I went out with my Mom this past spring – holy cow was I missing out?! They don’t taste anything like sliced tomatoes, which I don’t like at all. This particular restaurant had a spicy red pepper dipping sauce that was to die for. Enjoy your beach day – looks like a perfect day for it! I hope you like the corn and pepper taquitos! I love those things. 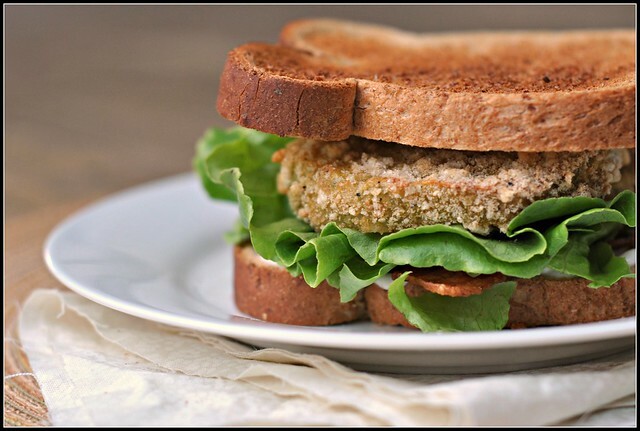 And I can’t wait to try this sandwich – I don’t think I’ve ever had a fried green tomato! Ooh, I bet my mom would love this! I’m passing it along for sure! 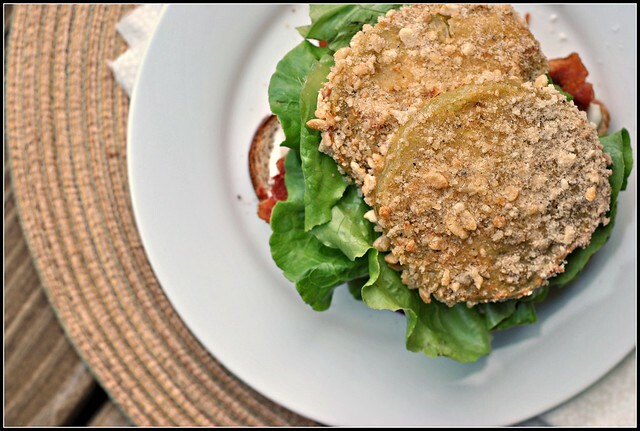 I’ve never had a fried green tomato, but this might be the recipe that pushes me over the edge! So, I have to say that I’m not one who usually comments on a stranger’s blog. I usually read the recipe, pin it, and move along. That being said, I have to tell you that I LOVE your blog. Having calorie specific categories is brilliant! And if that weren’t enough, you go and “healthify” such an amazing food. I had a fried green tomato BLT one time from a restaurant in town and did not even want to begin to fathom the amount of calories I consumed in that one meal. I enjoyed every last bite knowing I would probably never indulge again. I am so excited to try this lower calorie version. You rock!